Atletico Madrid missed the chance to go top of La Liga after drawing at Girona. 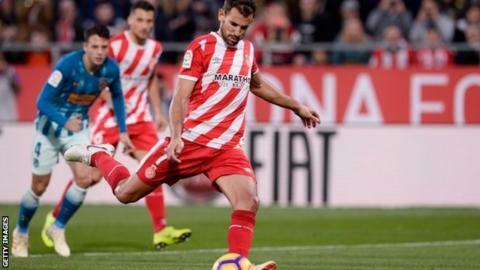 Girona striker Cristhian Stuani struck the opener from the penalty spot after he was fouled by Jan Oblak, becoming the league's leading goalscorer in the process with 11 for the season. English youngster Patrick Roberts was lively throughout and it was his pass to Stuani that led to the penalty. Atletico were on course for a first domestic defeat since 1 September but Jonas Ramalho's own goal denied Girona. Diego Costa expertly controlled Angel Correa's long ball on the edge of the area but Ramalho turned the ball past his goalkeeper while trying to intercept. Atletico were lacklustre for large spells although Saul did hit the crossbar in the first half and also forced a great save from Gorka Iraizoz. Sevilla remain as La Liga leaders but Barcelona can replace them if they avoid defeat against Villarreal in the early evening game. Match ends, Girona 1, Atlético de Madrid 1. Second Half ends, Girona 1, Atlético de Madrid 1. Attempt blocked. Valery Fernández (Girona) right footed shot from the left side of the box is blocked. Assisted by Borja García. Attempt saved. Gelson Martins (Atlético de Madrid) right footed shot from the right side of the box is saved in the bottom left corner. Attempt missed. Thomas Partey (Atlético de Madrid) right footed shot from outside the box is too high. Assisted by Antoine Griezmann. Attempt saved. Jonás Ramalho (Girona) header from the centre of the box is saved in the bottom left corner. Assisted by Álex Granell with a cross. Delay in match Diego Costa (Atlético de Madrid) because of an injury. Own Goal by Jonás Ramalho, Girona. Girona 1, Atlético de Madrid 1. Attempt missed. Gelson Martins (Atlético de Madrid) right footed shot from the right side of the box misses to the left. Assisted by Ángel Correa. Attempt saved. Saúl Ñíguez (Atlético de Madrid) left footed shot from the centre of the box is saved in the bottom left corner. Assisted by Ángel Correa with a headed pass. Corner, Atlético de Madrid. Conceded by Juanpe. Attempt blocked. Ángel Correa (Atlético de Madrid) right footed shot from the right side of the box is blocked. Assisted by Gelson Martins. Dangerous play by Cristhian Stuani (Girona). Substitution, Atlético de Madrid. Gelson Martins replaces Santiago Arias. Attempt missed. Ángel Correa (Atlético de Madrid) right footed shot from long range on the left misses to the left.